For those looking for Canon IJ or ScanGear MP drivers, there are now .deb packages for Ubuntu 18.04, Ubuntu 18.10, and also Ubuntu 16.04 via PPA. Thierry Ordissimo made the official drivers of Canon printers and multifunction devices, included versions 2.20 and newer, into PPA. There’s also sane backend for some scanners. mg2100, mg2200, mg2400, mg2500, mg3100, mg3200, mg3500, mg4100, mg4200, mg5100, mg5200, mg5300, mg5400, mg5500, mg6100, mg6200, mg6300, mg6400, mg6500, mg7100, mg8100, mg8200. mx320, mx330, mx340, mx350, mx360, mx370, mx390, mx410, mx420, mx430, mx450, mx470, mx510, mx520, mx530, mx710, mx720, mx860, mx870, mx880, mx890, mx920. 2. Install the setup utility, later can be launched from application menu. For Ubuntu 16.04, run sudo apt update to refresh system cache first. 3. 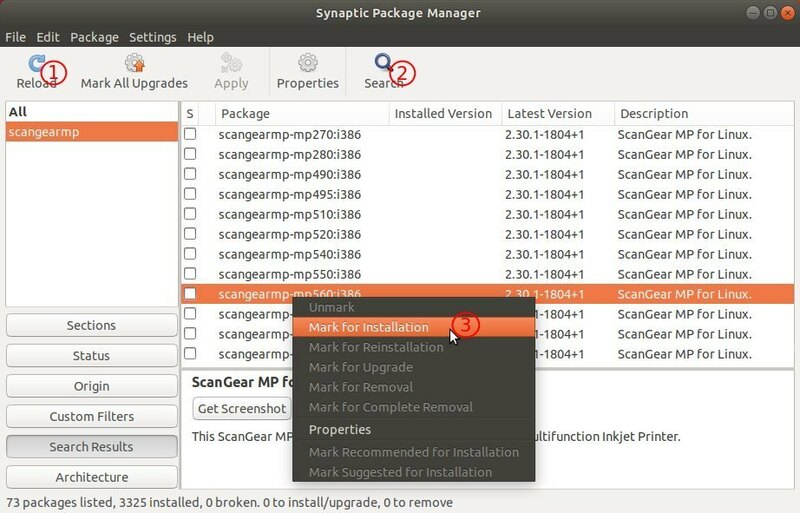 Depends on your device, search for cnijfilter (for printing) or scangearmp (for scanning) in Synaptic package manager (install it via Ubuntu Software). And finally select install the driver that is match for your device. And it’s OK to install i386 only package on 64-bit Ubuntu. To remove the PPA repository, go to Software & Updates -> Other Software.